As I was sitting there in the second row, looking up at that giant screen, I was lost in wonder. A gentleman sitting near me stood up and moved past and for a split second out of the corner of my eye I saw he was looking at me. It occurred to me how dumb I probably looked, a grown man of 32 years grinning like a child as the light of the film danced through the theater, but it flowed in and out of my mind so quickly I barely skipped a beat. A deservedly fleeting concern. I go see a lot of films at the cinema and it's always exciting, but an experience like this only happens a few times each year at most. Last year it was Mad Max: Fury Road and Star Wars: The Force Awakens. The year prior it was really only Boyhood. It's not that there aren't a bunch of other great films from those years, it's that not all greatness is created equal and boiling down exactly what I mean by that is challenging. It's more than just assigning a score or letter grade to every aspect of what goes into filmmaking. It's something you feel sitting there as the light of the screen dances across your face, lost in wonder, grinning like a child. 32. I'm starting to feel like I am entering that age range where I'm not really old nor am I young, and I know plenty of people who would read that and immediately think I am crazy because any number in the 30's is still young, but I don't feel like it like I once did. Truthfully though, how we view age is so reliant on perspective. When I was a kid and my Chicago Cubs addiction was beginning to flourish, the players on the team felt larger than life. Even the youngest players were grown men that towered above me, and being like them one day felt impossible. Now, coming off their first World Series title in 108 years, their opening day starting lineup in 2017 will feature only one person older than me, and that's based on the notion that Ben Zobrist will be in there that day which isn't a guarantee. For the first time in my life, watching my favorite sports team makes me feel old. The other day I revisited Whiplash, the 2014 film written and directed by Damien Chazelle. It's a great film elevated to a higher level of excellence by a thrilling, pitch-perfect final sequence that is so sublimely directed and edited, it feels like the work of a cinematic master. I went to sleep shortly after the movie ended, woke up and went to the theater to see La La Land, the new film by Chazelle and somehow it managed to be even better than Whiplash in every conceivable way, including the ending which is really saying something. La La Land is one of those films for me, this year's Fury Road or Boyhood, the type of masterful work that comes together in such a special way I can't help but get lost in wonder. I can't help but grin like a child and drown myself in the magic of movies. Damien Chazelle is going to be 32 years old in a couple of weeks, and for the next few months we will share the same age. When a baseball player reaches 32, he is believed to be exiting his prime years. It's typically downhill from there. Baseball makes 32 seem old. For a writer/director to be only 32 and already have created Whiplash and La La Land, it's remarkable. It's incredible. It's hard to believe. I look at his age and it feels like we have decades ahead of us to experience and appreciate what he is capable of as a storyteller, and I can't help but wonder if we still haven't seen the best of what Chazelle can deliver. Whiplash feels like an adrenaline rush and La La Land makes me want to get up and dance, but cautiously because I don't want to faint as I fall in love with the music and the magical movements of Ryan Gosling and Emma Stone. After one viewing, I'm totally in love and I fell hard. I have been humming "City of Stars" since I walked out of the theater and I don't want to stop. Damien Chazelle and his movies make me feel young. La La Land tells the story of Mia (Emma Stone) and Sebastian (Ryan Gosling), a couple of dreamers who dare to dream big. For her it's acting, and she tries to stay focused on her goals despite audition after audition that end poorly. For him it's jazz, the goal to keep his love for the music alive by opening his own club where he will play the style he has cherished forever rather than be forced to adapt to modern sensibilities. 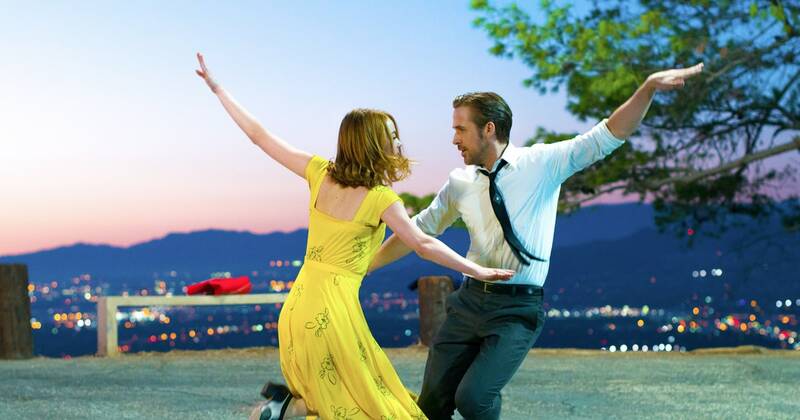 La La Land is a musical that borrows from the past but never feels weighed down by it, a completely original and magnificent piece of cinema that always feels romantic and not solely due to the blossoming relationship between Mia and Sebastian on screen. It's a love story and also a love letter to what makes a musical great, starting with an opening number titled "Another Day of Sun" staged during a traffic jam on a sun soaked freeway, a delightful long-take beginning full of color and perfect choreography. We are only minutes into the picture and have yet to even meet the main characters but a smile was already plastered across my face, and the crazy thing is it only gets better from there. The story unfolds seasonally, but regardless of if it's winter, spring, summer or fall, the color palettes of the production and costume design never lose their warmth, ranging from the breathtaking shot of Mia walking through some slowly falling fake snow to an homage to an iconic Singin' in the Rain set piece featuring a street lamp emitting a subtle glow as the day reaches dusk. The performances are perfect thanks to Gosling and even more so Stone, and their chemistry is essential to make La La Land work. I could see both of them up for Oscars this year, but for Gosling it would feel like recognition just to be nominated where as Stone has a chance to actually bring it home. Throw as many awards and bouquets at this immaculate film as possible. I won't complain. I certainly hope and expect to see Best Song boil down to a battle between "City of Stars" and the moving "Audition (The Fools Who Dream)", and the score by Justin Hurwitz will be bringing home the gold statue. Count on it. Silly as it seems, at times I feel old. Damien Chazelle, La La Land, Mia and Sebastian all made me feel young again, delivering a slice of sublime entertainment that made me want to sing and dance, if only I could do either. I feel inspired to try. I feel inspired to keep trying, keep believing and keep dreaming. I have seen a lot of great films from 2016, including what is my favorite documentary of all time, but La La Land is that first truly special experience that doesn't happen often. I have learned to cherish the hell out of it when it does. I really loved La La Land, so much that it's in my top 5 of the year. I'm also a big fan of the director, and I believe Whiplash to be a perfect film. I don't think I could even fathom a flaw within it. La La Land is definitely different, and I don't think it's at Whiplash levels, but it's still a really emotional movie that was done superbly, so if this is what Chazelle's level of filmmaking brings, then bring it because it's great. That's terrific Cody, glad you love La La Land too. I recently took the soundtrack out at the library and have been listening to it pretty much non stop sense. It's just such a joyous, wonderful film. Going to see it again this Saturday, taking my mom, I know she will love it.